In the past, I have been lucky enough to be included in a few online tastings featuring wines from some of the small, family owned wineries of Lodi. 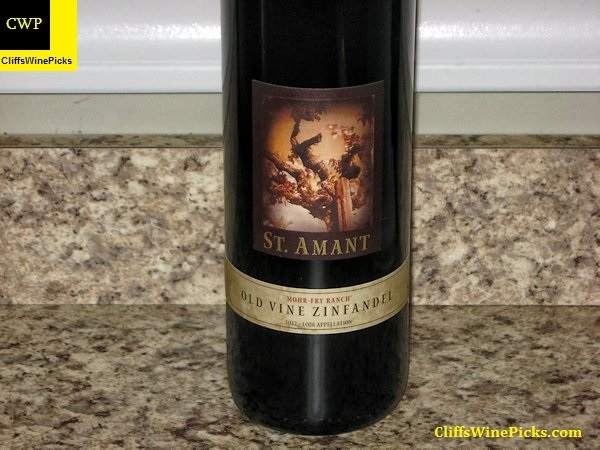 During a couple of the events, wines from St. Amant were included in the groups. The wines caught my attention as wines worthy of being “hunted down”. A couple weeks ago, I saw this wine on the shelf at a local wine store and immediately grabbed a couple bottles. If your knowledge of wines from Lodi is based on a taste of a large production wine from a giant winery, you owe it to yourself to check out the outstanding wines being produced in a much smaller quantity by the smaller artisan wineries in the region. St. Amant was founded in 1981 by Tim Spencer and his wife, Barbara St. Amant Spencer. The couple started out by grafting over two acres of Zinfandel vines to the Portuguese varieties, Avarelhao, BastardoSouzao, Tinta Cao and Touriga Nacional. Eventually other European grapes were added like Tempranillo and Barbera. In 1992 the winery began working with the Lodi Winegrape Commission to produce single-vineyard, small production wines for them to market the region. At that point, virtually no Lodi labeled wines were being made and the Commission wanted to showcase the quality of Lodi vineyards by demonstrating their potential with small artisan winemaking. In 1996 after a legal battle with their landlord, the family had to quickly move the winery to a new location. They found a place in Lodi, and setup shop at the old Guild Winery. This was a post prohibition era winery, built in the late 1930’s. It was anything but picturesque, but it was functional, and allowed the family to continue making wines. The winery released their first Lodi “branded” Zinfandel wine in 1997, as they say, the rest is history. It was also at this time the family vineyard was dying of phyloxera. When the vineyard dies in a winery that makes wine from the grapes they grow, it could be a problem if not a catastrophe. At that point Tim Spencer worked out a deal with the Lodi Winegrape Commission – if a grower brought them 2 tons of grapes, they would make the wine, give them 25 cases, and keep the balance for themselves. They had numerous growers take them up on the offer. One day Jerry Fry showed up with 7 tons of beautiful Old Vine Zinfandel grapes. Tim didn’t know what to do, he didn’t have the money to pay for the grapes, and they had no idea how the wine would turn out. Jerry told him not to worry about it, that they would work it out later. The winery ended up bottling 450 cases of that first vintage. It won a bunch of awards, sold out quickly, and has since grown to be their most popular wine. Much more information about the winery, family and their wines is available by clicking here. While my father may not have attended the Disney school of customer service, his point was that our winery was built to make wine, not entertain guests with “non-wine” experiences. Our winery was built with the express intent of making the best wines possible. Although we’re housed in an old industrial winery, where the drain tends to be the highest point in the room, we’ve built our winery to produce exceptional quality hand-crafted wines. We make all our wines on site. From crushing to bottling, the wines never leave our control. We do everything by hand, in small lots, and by a few people. This gives us an intimate understanding of each vineyard, each vintage, and each lot of wine so that we can consistently produce original hand-crafted wines. Mohr-Fry Ranch is farmed by our good friends Jerry and Bruce Fry. 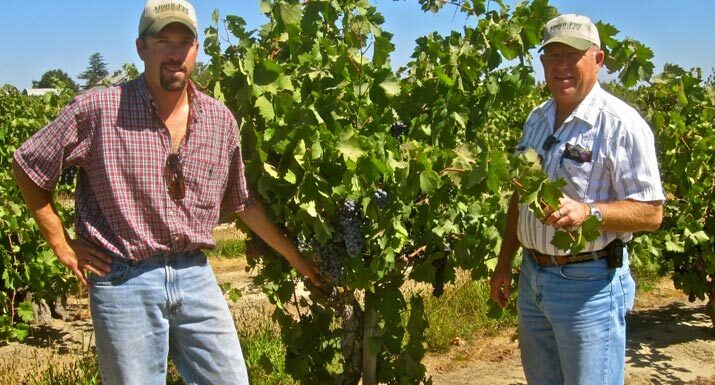 The father and son team is responsible for managing the family’s diversified farming operation that includes winegrapes and heirloom beans. The family has been farming in California for over 150 years, and their vineyards are the source of our most popular wine – Mohr-Fry Ranch Old Vine Zinfandel. Their home ranch sits directly south of the city of Lodi, on a beautiful 225 acre ranch comprised of 9 separate blocks of own-rooted Old Vine Zinfandel dating back to 1901. We source grapes from multiple vineyard blocks planted between 1901 and 1945. All of them are head-trained and planted on their own roots in very sandy soils. In our opinion, these vineyards produce some of California’s best Zinfandel wines, consistently ripening beautiful grapes. This vineyard was one of the first “certified” vineyards under the Lodi Rules for Sustainable Winegrowing. The Lodi Rules takes a comprehensive approach to address the overall health of the vineyard and ecosystem. The farming standards go beyond just pest management to promote practices that enhance biodiversity, soil and water health, and employee safety. For more information, please click here. (Even though I paid a bit more at the local store, the suggested retail price for the wine is only $18. It is available to purchase for $18 on the winery’s website by clicking here. This wine is a blend of 100% Zinfandel that comes from two vineyards planted on Mohr-Fry Ranch. One vineyard was planted in 1901, the other in 1944. The head-pruned vines are own-rooted and are situated in the sandy soils just southwest of the city of Lodi. The vines benefit from the distinctive delta breezes that cool the appellation in the late afternoon and early evening creating an ideal climate for high-quality Zinfandel. The grapes were harvested from September 25th through October 2nd. The grapes were hand sorted and fermented for 7 days at cool temperature with gentle pumpovers. The wine was aged for 10 months in 60 gallon American oak barrels, with 25% being new. A total of 3.068 cases were bottled on July 13, 2013. The wine has 14.9% alcohol and the bottle is sealed with a natural cork.